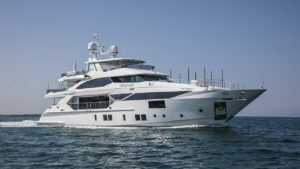 Charade, a 38-metre superyacht in the Benetti Class product line, built from composite materials and carbon fibre, has been delivered to its owner at the yard facilities in Viareggio. Featuring the innovative D2P_Displacement to Planing® hull, “Charade” is also fitted with the Azipull Carbon 65 propulsion system developed in partnership with Rolls Royce. On June 25, less than three months since its launch, the sixth unit in the Fast 125’ category, Charade, was delivered to the owner. Like the other Fast category yachts, this 38.1-meter long, 8.45-meter wide superyacht has the innovative D2P_Displacement to Planing® hull with wave piercer, designed by Pierluigi Ausonio with the Azimut|Benetti Research and Development centre to deliver high performance at top speed and reduced consumption when cruising. Speed associated with comfort is the guiding thread running through all Fast 125’ models and Charade, too is fitted with powerful Azipull Carbon 65 thrusters (AZP 65). This highly efficient and reliable propulsion system is also extremely lightweight because of the extensive use of composite materials. Developed in partnership with Rolls Royce, the innovative system delivers excellent performance in terms of both manoeuvrability and speed (the top speed is 24 knots). The AZP 65 thrusters reduce the weight of the yacht’s propulsion system, as well as offer even quieter running and better distribution of onboard spaces. Being placed right at the stern, they allow the garage to be inserted between the engine room and the guest cabins for better insulation against noise and vibration. The sporty, flowing exterior lines are designed by Stefano Righini, while the interior decor by renowned UK-based design firm RWD was enriched during construction with contributions from both the owner’s and the shipyard’s team, working in close collaboration. There are three possible configurations for Fast 125’ models, Air, Land and Sea, and “Charade” is fitted out with the Air option, the more contemporary of the three, featuring a modern design with clean, simple lines embellished by polished metal accents. In fact, steel is used for the frames of both the numerous works of art on board, chosen and supplied by the owner, and for the televisions and bedheads. The carpet, which is of a different colour in each setting, has a circle leitmotif, like the decorations on the glass surfaces, balustrades and shower doors. All the ceilings are clad in majilite and leather. The four guest cabins are located on the Lower Deck: two symmetrically-positioned VIP cabins with double beds and bathrooms decorated with varieties of white marble, and two guest cabins with sliding and one with pullman bed. Forward on the Main Deck is the full-beam owner’s cabin. Flooded with natural light that pours in through huge glazed surfaces on both sides, it is appointed with a master his and hers bathroom decorated with elegant onyx and “larch” marble. On the main deck are the living space with dining area and the roomy kitchen, from which the crew has access to their own cabins on the Lower Deck or the pantry on the Upper Deck using special stairways. This solution means that excellent service can be provided at all times, without ever encroaching on the privacy of the guests on board. To reach the Upper Deck, guests can use a steel and glass aerial stairway specially designed by RWD and customized with backlit stone step tops. Here there is a more informal living area with a plexiglass grand piano, a gaming table and a sofa area with television, representing the ideal space for some rest and relaxation on board. Outside, there is a spacious area for dining and relaxing, furnished with teak and steel drop-leaf tables that can be found in all the outdoor spaces. Still on the Upper Deck, but forward in the bow area, is an original custom swimming pool designed by the shipyard that can comfortably accommodate six people, accompanied by big sun lounging pads and a comfy sofa area. The spacious Sun Deck is split into three areas: a lounge with a big sunbathing pad that can be transformed into sofas; a dining area with a coffee table that can be converted into a dining table and a big bar counter with a retractable 55-inch TV; and an area in the bow with sofas and low tables ideally placed to enjoy the panorama when cruising. The hard top roof reproduces a starry night sky. There was a special focus during the design process on lighting, with extensive use of innovative thin light panels integrated into the décor of the interiors, while outdoors the lights are all RGB, including the underwater lights and yacht name lighting, and can be changed to any colour in the spectrum in perfect synchrony.